Just like grieving, no words can also express our gratitude to those who showed kindness during our dark times. Yet, a simple funeral ‘thank you’ note is a good way to acknowledge their help and to thank them for sharing their time with you and your family. With a thank you note, you can convey your appreciation of their presence and assistance. Writing and sending a funeral thank you note doesn’t have any rules yet there are some guidelines that you can follow when writing a funeral thank you note. We call these guidelines as funeral ‘thank you’ etiquette. It is not a requirement to send a ‘thank you’ note after a funeral. We do it to show gratitude and appreciation though. 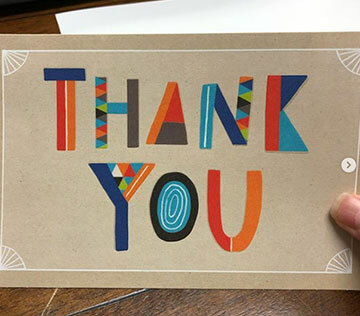 When sending a ‘thank you’ note, be aware of these simple guidelines. Give a warm regard – say sincerely, with love, much love, many thanks etc. With the advent of technology and the internet, you can just send an email to say thank you, send a text message or chat message or make a quick phone call to anyone that attended your loved one’s funeral. These actions can get the job done – you can still thank them. However, there is something that a handwritten funeral ‘thank you’ note can do that electronic messages cannot – it makes the appreciation more heartfelt and sincere. Perhaps, we should include this as a funeral ‘thank you’ etiquette—meaning we should never underestimate the power of a personalized handwritten funeral ‘thank you’ note. At such a difficult time, remember that sending a funeral ‘thank you’ card or note is not a must. For some people though, the thought of writing such can be comforting. It allows a person to think of the good times and the good people who loved the deceased. If you are in such a situation and you cannot find words to say, you can always ask for help from your family members, from the funeral director who handled the funeral or from special groups who are known in providing funeral ‘thank you’ notes.